Beautiful guitar. 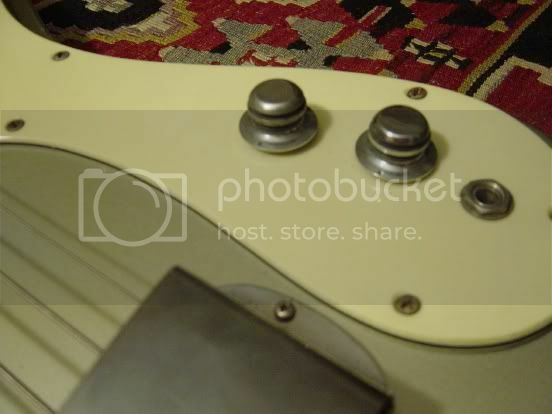 The screws on neck plate lends itself to be close to a '64 although pots date it to '65. The neck plate could be a left over parts bin item. The serial number, Wow, that's a curve ball. I don't think it would have been any kind of 'one off' or 'prototype' as it appears to be a standard model minus the Ventures logo. Maybe a later refin? Check out the link of Bob K's basses. Although he shows them by year of mfg, he doesn't list his guitars with serial numbers. They obviously had the Ventures logo on the headstock early on. I think the first bolt on was #5000. 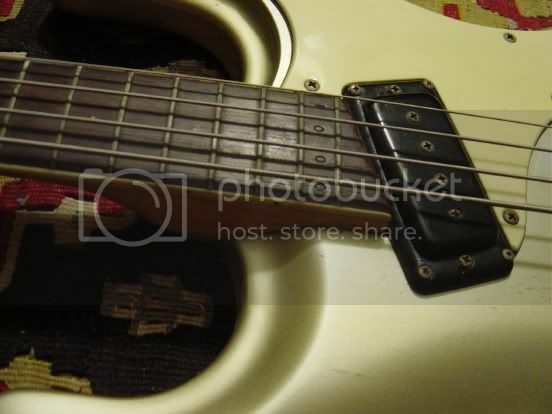 (production).This bass looks like it's silver thats yellowed out. Heck, that makes me want to be a bass player!!! What a fine instrument. It sure is a beaut! I don't think I've seen another where the back of the headstock is painted but the neck isn't. MWaldorf wrote: It sure is a beaut! I don't think I've seen another where the back of the headstock is painted but the neck isn't. Here's a '67 Mark V on eBay that has a back painted headstock. It is being represented as a custom or special order. That gold (silver?) bass can't be ruled out as a custom build. Because it has a serial number of 0001 stamped onto the 20th fret, I've always believed this to be some sort of prototype or a one-off custom bass. It's essentially a Ventures bass, but without the "Ventures" logo on the headstock. 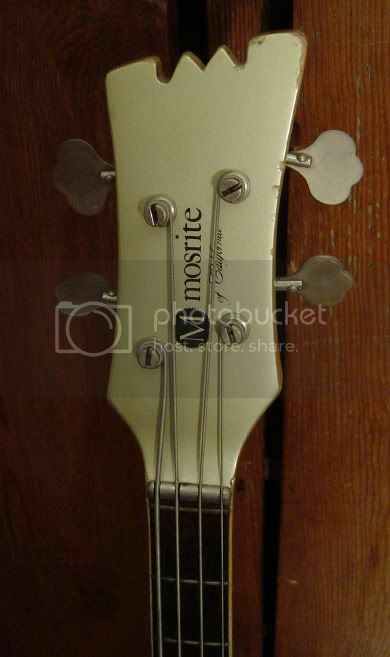 Has anyone seen a gold 60s Mosrite before? 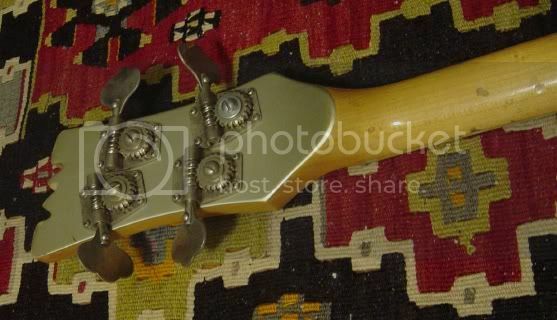 Any info appreciated..
Just a side note: the matching headstock (front and back) was relatively common on "special" or custom color instruments circa 1965. I've seen a Maphis octave doubleneck in pearl white with the same treatment, as well as Jay Rosen's octave guitar.